Upload your modules and invite users to review with one quick action. Invited users can see and access the module and feedback through HOWL.pro’s user friendly dashboard. For reviewers, stakeholders, developers and more! HOWL.pro allows all levels of users to collaborate together with no barriers. Users can add tasks and comments to the actual course slides, without screenshots and in the same browser window, so you always know where you are. HOWL.pro supports the leading authoring tools (Adobe Captivate, Articulate Storyline & Lectora) to support your team no matter the project. Copyright © 2019. HOWL Pro is a product of Digital Balance Ltd.
HOWL.pro is a product of Digital Balance LTD. Registered office: Unit 6 Phoenix Works, King Street, Longton, Stoke on Trent ST3 1EZ. Company No. 08561394. Digital Balance is a VAT registered LTD company and all payments are subject to VAT. The Digital Balance registered VAT number is: 165 1864 93. Digital Balance will fully comply with all the requirements of the latest Data Protection Legislation. You are solely responsible for Your data and for Your use of the Service. The Service may be used for lawful purposes only. Transmission, storage, or distribution of any information, data, or material in violation of any applicable laws or regulations is prohibited. This includes, but is not limited to: copyrighted material; trademarks; trade secrets or other intellectual property rights used without proper authorisation; and/or material that is obscene, defamatory, constitutes an illegal threat, or violates export control laws. Unauthorized and/or unacceptable use of the Service is a violation of these Terms, may result in Digital Balance terminating Your account and may subject You to criminal and/or civil liability. You acknowledge and agree that Digital Balance may send You e-mails related to Your account and/or the Service. You agree that Digital Balance can use Your company name or logo in its advertising unless and until You tell us in writing not to. You must be a registered user to access the Service. You are responsible for keeping Your password secure, and You are solely and strictly liable for any activity that occurs under Your username. You also agree not to access, or attempt to access, other user’s accounts and/or data. All support issues need to be raised within the HOWL ticketing system. Any requests that fall outside of support will be incorporated into version releases. Digital Balance will not issue cash refunds under any circumstances. If You have a question about charges made to Your account, please contact Digital Balance immediately. If the charges were made in error, Digital Balance will credit Your account for the appropriate amount. Digital Balance has a zero tolerance policy for refunds. The Service is provided “as is” and You use it at Your own risk. Digital Balance expressly disclaims all warranties, express or implied, including without limitation the implied warranty of merchantability, the implied warranty of fitness for a particular purpose and the warranty of non-infringement. We try to keep the Service bug-free and safe, but Digital Balance does not warrant or ensure continuous, error-free, secure or virus-free operation of the Service or Your account. You understand and agree that You shall not be entitled to make any claim based on Digital Balance’s failure, irrespective of fault, to provide any of the foregoing. Like we said, You use the Service at Your own risk. Without limiting the foregoing, the Service is not designed or licensed for use in hazardous environments requiring fail-safe controls, including without limitation operation of nuclear facilities, aircraft navigation/communication systems, air traffic control, and life support or weapons systems. If someone’s life or the fate of the free world depends on Your use of the Service, please do not use the Service. Some jurisdictions do not allow the disclaimer of particular warranties, and, to that extent, the foregoing disclaimers may not apply to You. To the extent that You live in a jurisdiction that refuses to enforce the foregoing disclaimers, Digital Balance disclaims all warranties, express and implied, to the extent permitted by law. In no event will Digital Balance be liable to the user or third parties for any damages, including but not limited to direct, indirect, special, incidental, consequential or punitive damages (including but not limited to loss of use, business interruption, loss of profits or loss, corruption and/or alteration of data) arising out of or in any way related to Your data and/or Your use of the service and/or Your account, whether in an action in contract, tort, equity or otherwise. User voluntarily engages in the activity of internet use and bears the risks associated with that activity. You will be solely responsible for any damage done to Your computer or Your data that results from such activity. In no event will Digital Balance have any liability to You or any third party for unauthorized access to or use, alteration, corruption, theft or destruction of Your data and/or Your account. Digital Balance’s liability is expressly limited for any reason and upon any cause of action to the amount You actually paid to Digital Balance for the Service during the three months immediately preceding the date on which You claim the cause of action accrued. Some jurisdictions’ laws prohibit the foregoing limitation of liability provision. To the extent that You live in a jurisdiction that refuses to enforce the foregoing provision, Digital Balance’s liability is limited to the greatest extent allowed by the law of that jurisdiction. You agree to indemnify, defend and hold harmless Digital Balance from all damages, liabilities, claims and expenses, including without limitation attorneys fees and costs, arising from or related to Your data, Your use of the Service and/or any breach of these Terms by You. You further agree to defend, indemnify and hold harmless Digital Balance from all damages, liabilities, claims and expenses, including without limitation attorneys fees and costs, arising from or related to any claims by third parties that Your data or Your use of the Service infringes upon, violates or misappropriates any of their Intellectual Property Rights or discloses their Proprietary Information. We reserve the right to terminate Your account at any time and for any reason so long as permitted by law. Accordingly, We may, but have no obligation to, remove accounts and content containing what We determine, in our sole discretion, to be unlawful, offensive, threatening, defamatory, obscene or otherwise objectionable material. In the event of termination, You will lose all data related to Your Account. An account terminated by Digital Balance will not be backed-up for any reason and will be immediately terminated from Digital Balance’s servers. You may terminate Your account at any time, but Digital Balance will not under any circumstances issue any refunds of monies paid. Digital Balance claims no intellectual property rights over the data You provide to the Service. You acknowledge and agree that Digital Balance owns all right, title and interest in and to the Service, including without limitation all intellectual property rights. You agree that You will not copy, reproduce, alter, reverse engineer, clone, or modify the Service or create derivative works from the Service. Neither party shall be responsible for any failure to perform, or delay in performing any of its obligations under these Terms, where and to the extent that such a failure or delay results from causes outside the control of such party. Such causes shall include, without limitation, failures caused by a third-party Service, acts of God or of the public enemy, acts of the government in its sovereign or contractual capacity, fires, floods, epidemics, quarantine restrictions, freight embargoes, strikes, civil commotion or the like. Recognizing the global nature of the Internet, You agree to comply with all applicable laws regarding the transmission of data exported from the United Kingdom or the country in which You reside. 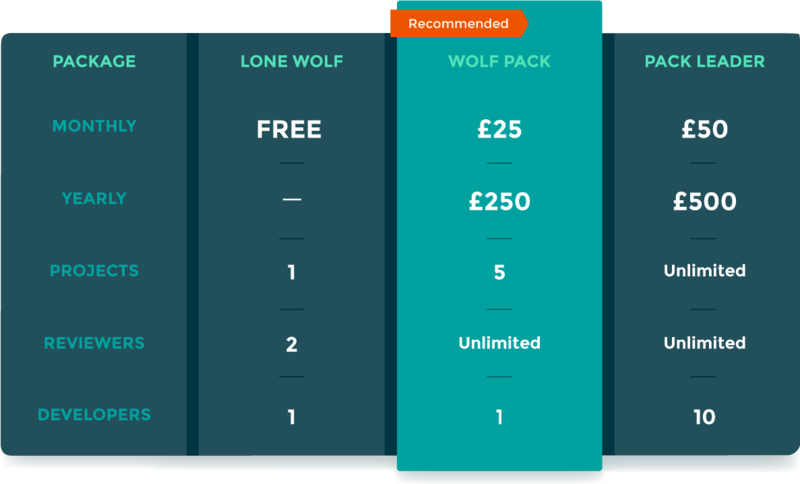 The 14 day free trial is available on sign up to new Wolf Pack and Pack Leader account types. After initial sign up your first payment (as chosen during the sign up process) will be charged, unless cancelled prior to the end of the free trial. One per customer. Not available to customers re-joining with the same account details. For any additional detail or questions on any of the above please contact us on help@howl.pro or raise a ticket through Your account profile page. Free account allows access to the Lone Wolf account type only. One per customer. Free account is subject to change.